How to Make Grilled Chicken Soy Delicious Deals .In this episode we want to share with you how to make grilled chicken that tasted delicious and scrumptious. Usually on nights bekumpul with family, relatives or grilled chicken trader itself. 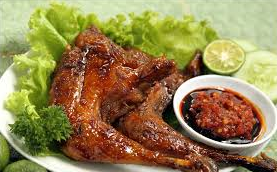 The point we are not just grilled chicken but how to let hasilnyaterasa nikmat.macam delicious and grilled chicken are served indeed disparate, no soy sauce spicy barbecued chicken, barbecued chicken oven soy sauce, soy sauce honey grilled chicken and others. In addition to the delicacy of chicken meat are also many benefits, among others, healthy bones, builds muscle, and also can prevent heart attacks. But this time we are not discussing about the usefulness, perhaps it can be said to add to our knowledge. Ok, then we direct our course to the point about how to make a roasted chicken specials that tasted delicious and scrumptious. If you can you prepare materials and peralatanya first let ga keteteran later. The following recipe is checkidooot. In order to make this grilled chicken smoothly we should start by reading Bismillah. Wash the chicken first we are going to burn in order to awake kebersihanya. Marinate chicken is clean with lemon juice and salt, wait for 15 minutes later. Then heat the oil. Saute the ingredients until smooth, in order to feel fragrant add the lemon grass and lime leaves. Add the chicken to the mix and seasoning and stir until the color changed though. Add seasoning pepper, sugar, soy sauce, tamarind and water. Then stir and process until the marinade evenly, flavoring permeates the meat and cook until done. Oo yes, that the occasional grilled chicken tasted fragrant herbs and do not forget to spread with grilled chickens while inverted behind though perfectly ripe. 0 Komentar Untuk "How to Make Grilled Chicken Soy Delicious Deals"